little illuminations: A Gift for Dad, A Book To Share and A Blog Hop! 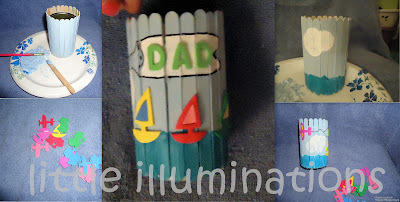 I'm thrilled to participate this month in the Preschool Blogger Network's "Father's Day Book and Activity" Blog Hop! I am always stumped for good ideas for gifts kids can make for Father's Day. 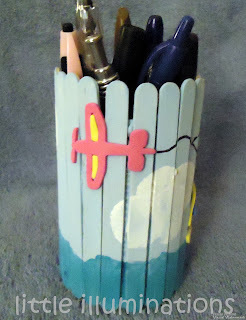 I came up with this simple pencil can that is so easy for kids to make and can be decorated for any theme or interest. After letting glue dry, paint and decorate to suit Dad's interests. 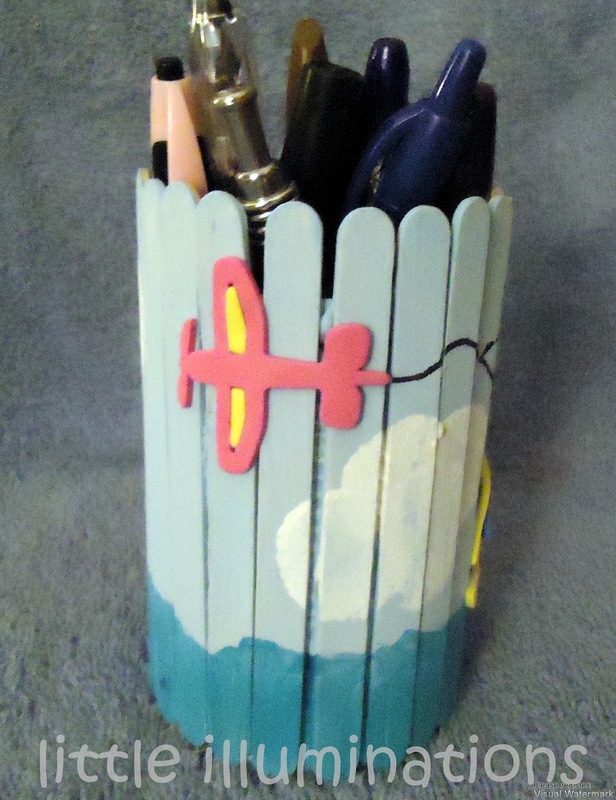 My husband has an affinity for sailing, so we made our can with a little sailing scene with a banner plane that pulls a banner that says "Dad". 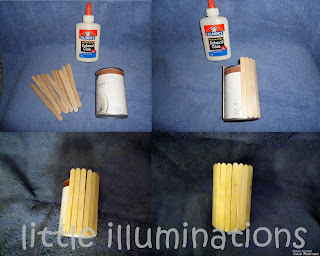 We used foam stickers for embellishments. Another thing I like about this project is that it is easily adapted for any person or occasion. 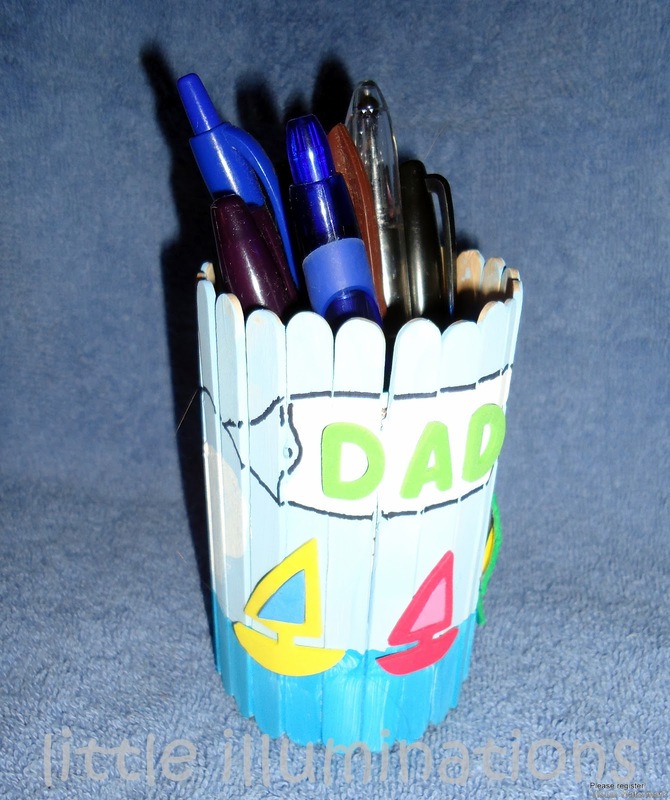 If a student does not have a father, or a father figure, it can be decorated for Mom or Grandma. I take note of those situations at the beginning of the year and ask the family how they want to handle it. Often, there is a grandfather, uncle or other father figure in the picture. If this is the case, you may want to read a book about non-typical families. 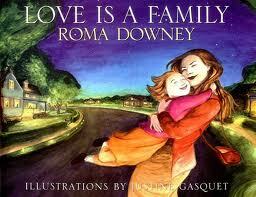 I've heard really good things about the book "Love is a Family" by Roma Downey from Touched By An Angel. There are tons of good children's books out there about Dads. 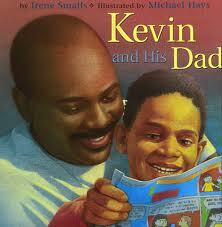 My favorite is "Kevin and His Dad" by Irene Smalls. Dad and Kevin spend the day together doing chores and enjoying their time together. I love that the focus is on finding the joy together in simple, everyday activities! Be sure to stop by these wonderful blogs and check out the books and ideas they are sharing today! Thanks for sharing another great post. I don't know what I did wrong, but my linky code didn't embed itself and just appears as html at the end of my post. How wise to inquire at the start of the year about handling family issues. Thanks for sharing this project and the books! Thanks, JoAnn! I find it's always better to handle the difficult situations early, so there are no hurt or hard feelings. I don't ever want my families to be uncomfortable or feel that I am not respectful of their family situation. Cool and useful gift idea, Ayn! I am enjoying finding out about all these good family books as well! I love these book + activity blog hops, because I get so many wonderful titles to explore. I was sure that I'd already be familiar with many of the books about fathers, but most of the titles in the blog hop so far are new to me. Yay, for new books!! !